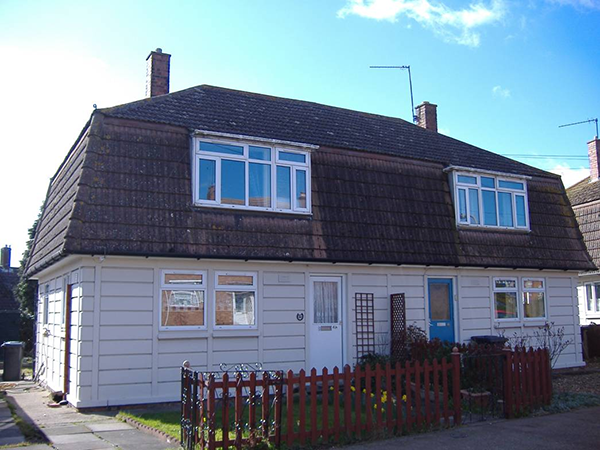 After World War Two there was a need for more housing to be supplied quickly which led to the development of many types of ‘temporary’ non traditional housing throughout the United Kingdom. The Cornish Unit is one of the most recognisable types and there are many located throughout Cornwall and beyond. There are two main types of Cornish Unit buildings, type 1 and type 2. Type 1 Cornish Units are typically two storey properties with pre-cast reinforced concrete panel walls at ground floor level and second storey accommodation within in a timber framed mansard roof. Type 2 Cornish Units are generally two storey residential properties with pre-cast reinforced concrete external walls over both storeys. These properties are generally poorly insulated and are difficult to retrospectively upgrade effectively with considerable heat loss experienced. The pre-cast reinforced concrete is susceptible to carbonation which over time can lead to the reinforcement corroding and the cover concrete detaching exposing the reinforcement. This can lead to loss of structural integrity. These are the main reasons Cornish Units were included in the list of properties that were classified as defective under the Housing Act 1985. Many lenders choose not to lend against them as they feel they do not offer suitable security for their mortgages. There are recognised repairs to these properties which generally involve propping up the roof structures, dismantling the pre-cast concrete external walls and constructing modern cavity walls in their place. This removes all of the pre-cast concrete and is disruptive and expensive to complete. The repair needs to be a recoginsed repair and properly certified for most mortgage lenders to then lend against. « Have You Checked Which Part Of London Is Right For You To Invest In Property?